This game of Chinese dominoes may sound complicated but is in fact very simple to play. The name fishing comes from the idea that players fish for matching dominoes. The game was originally played with bone or wood dominoes. 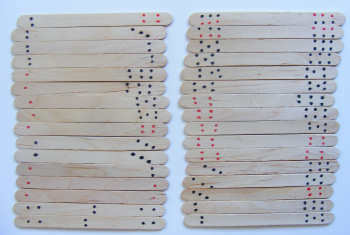 You can either print out our dominoes or, for a more authentic set, use popsicle sticks and draw on the dots with black and red pens. 2 sets of our Chinese Dominoes printable (scroll down) or home-made wooden dominoes (see instructions below). If you are making wooden dominoes you will need 64 popsicle sticks and red and black permanent markers. Using our print-out as a guide draw the dots on to the sticks. Remember to make two sets. Shuffle the dominoes and deal them into 16 piles of 4 dominoes. Lay these piles face down on the table. Take 4 piles and lay these face up in the playing area between the two players. Each player then takes 3 piles of dominoes and looks at them. If they have a pair of 6s they put the pair in front of them. Player 1 then looks at the dominoes in the playing area. If they can make a pair with one of the dominoes in their hand they take that domino from the playing area, match it with the domino in their hand, and lay the two dominoes in front of them. Player 1 then picks up a domino from one of the face-down piles. If it matches a domino in their hand, again they lay the pair in front of them. If not the domino is laid face up in the playing area between the two players. Player 2 then has their two tries to fish for pairs. Play continues until all the piles of dominoes are gone. First, unpaired dominoes are put to one side. Now, each player splits the pairs they have won into minnows (dominoes with less than 8 dots) and large fish (dominoes with 8 or more dots). Minnows score one point for each red dot. When you have the total minnow score this is rounded up to the next 10 (so a score of 4 becomes 10, and a score of 16 becomes 20). Large fish score two points per dot (in either colour).